Jdom is the most developer friendly XML parser to read and create an xml file in Java. Jdom's programming friendly nature provides mechanism and implementation that makes it easy to xml parsing for java developers. JDOM uses one of the two mechanism, DOM or SAX to parse an xml but using JDOM we uses SAX and JDOM from its own and not the one provided by JDK itself. JDOM is not available internally in JDK so we need to add an external jar to start with it, Jdom2 jar can be downloaded from HERE. In today's discussion we will see step by step implementation of Jdom2 parser to make it possible, read xml and create xml in Java. Here is the overall project structure for today's discussion, we have added an external jar file in 'lib' folder to take advantage of jdom2. Please make sure that the jar is included in classpath. 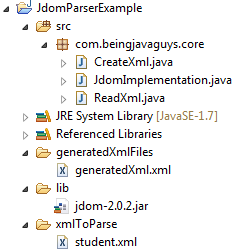 'xmlToParse' folder contains a sample xml file that we will read using jdom. 'generatedXmlFile' folder contains the created xml file from java code. 'CreateXml.java' file contains code for creating xml file and 'ReadXml.java' file contains code for parsing and reading xml in java. Reading xml in java using jdom is a very simple process we just need to implement any of the two either DOM or SAX object, in our case we have used SAX. We have called two classes here, please make sure to commented out one by one to see exact implementation. In this particular blog we cam across 'How to read xml in java using jdom2 parser' & 'how to create an xml file in java' and 'how to use jdom2 for xml parsing'. In upcoming blogs we will come across more about more Xml parser in Java and their implementation. To know about DOM and SAX implementation in Java click Here. Read more about XML & JSON under SAX & DOM & XML parser in Java JSON, and JAXB - Marshalling & Unmarshalling in Java categories.